At first glance, the two stories — each bookending a tale of boom and bust — both seem too farfetched to be true. The first is the incredible ascent of the Tibetan Mastiff in China, a canine corollary to Holland’s 17th-Century tulip mania. 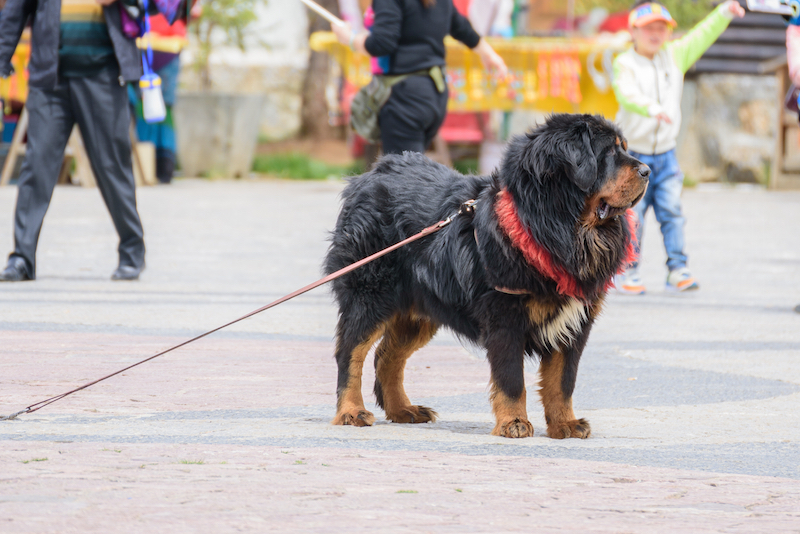 Almost a decade ago, Tibetan Mastiffs were selling in record numbers, and for record prices, the crescendo of which was in 2011, when a coal baron reportedly paid more than $1.5 million paid for a yearling Tibetan Mastiff aptly named “Big Splash.” Whether actual cash changed hands — or whether clever Chinese breeders swapped breeding stock instead — rearing Tibetan Mastiffs soon became a very profitable cottage industry. But what goes up, must come down, and by the beginning of this decade, the Tibetan Mastiff bubble had burst. Top-quality puppies were available at a fraction of their original cost, and breeders had a glut of dogs no one was clamoring to buy. As unlikely as it sounds, a flood of unwanted Tibetan Mastiffs is indeed impacting the conservation of the snow leopard in Tibet, says Mingyu Li, a consultant with the Shan Shui Conservation Center who has been studying the impact of the dogs for his doctoral thesis at Peking University. A Tibetan Mastiff in Shangri-La, China, available for photographs with passersby and tourist. Since the collapse of the Tibetan Mastiff market, some dogs have been sold for meat, while others have been turned loose and abandoned. About a third of the dogs appear to be typey, presumably purebred Tibetan Mastiffs, while the rest are arguably mixes. “They are usually middle- to large-sized mastiffs,” Li explains, “since the biggest ones can still get good prices and the smallest usually have low adaptability” on the rocky, oxygen-starved Tibetan plateau. Solitary and secretive creatures who usually hunt alone, or occasionally with a sibling, snow leopards live within about 2 million square kilometers in a dozen countries that straddle the Himalayas and the mountains of Central Asia. About 60 percent of the snow leopard’s habitat is in China, and it forms a rough crescent shape, from the steppes of Mongolia/Kyrgyzstan to the north to the Hindu Kush ranges of Afghanistan to the west to southern Tibet, which skirts the borders of India, Nepal and Bhutan. What those countries all have in common is a rocky, ridged, mountainous landscape that appeals to the secretive snow leopard, which slinks among the jagged cliffs and rocky bluffs when hunting. A snow leopard demonstrates how it blends seamlessly into the rocky terrain in which it lives and hunts. Snow-leopard experts say that the shy cats are not particularly aggressive when confronted by other predators, preferring to abandon their kills rather than defend them from bears, wolves or, increasingly, dogs. The reason for confrontations between dogs and snow leopards on the Tibetan Plateau is that “dogs have the same activity pattern as the prey of the snow leopard,” which varies depending on terrain, Li explains. 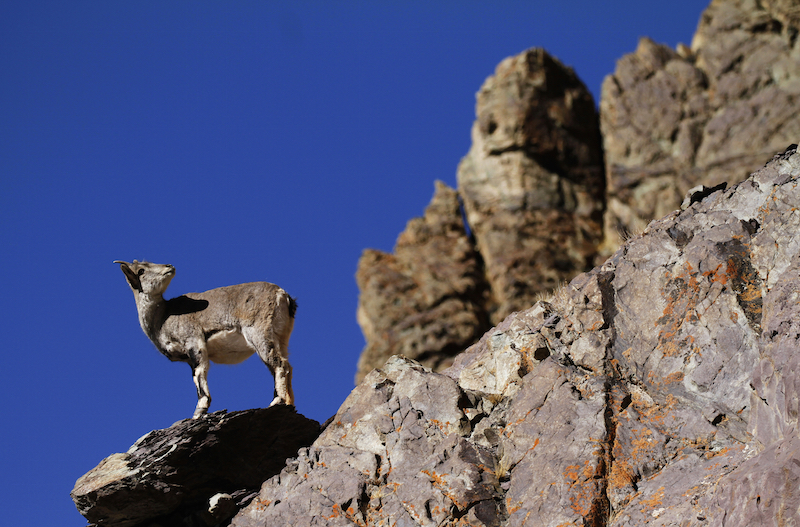 In the area Li is observing, China’s Qinghai province, the preferred snow-leopard snack is the Himalayan blue sheep. 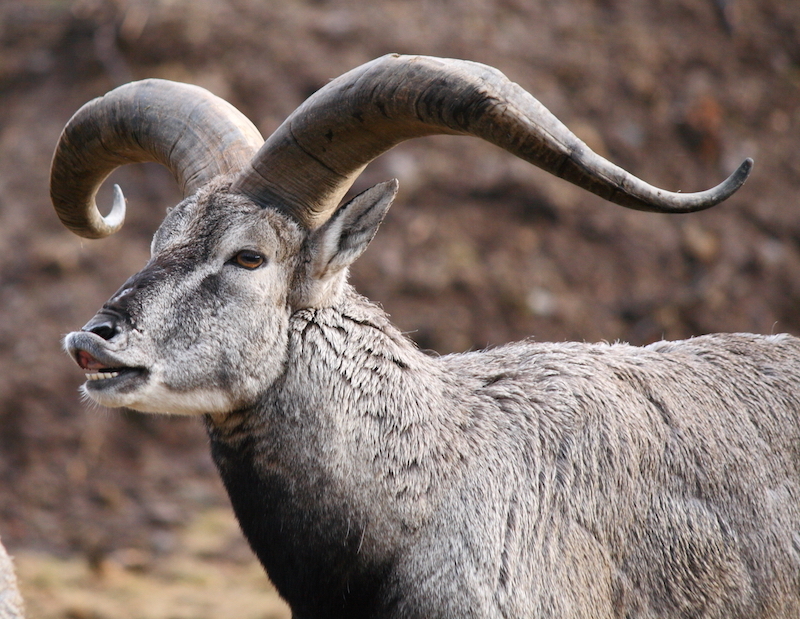 Himalayan blue sheep, on a rocky outcropping (above) and up close (below). Also called a bharal, the wild sheep is a major source of food for snow leopards — and, increasingly, for abandoned Tibetan Mastiffs. 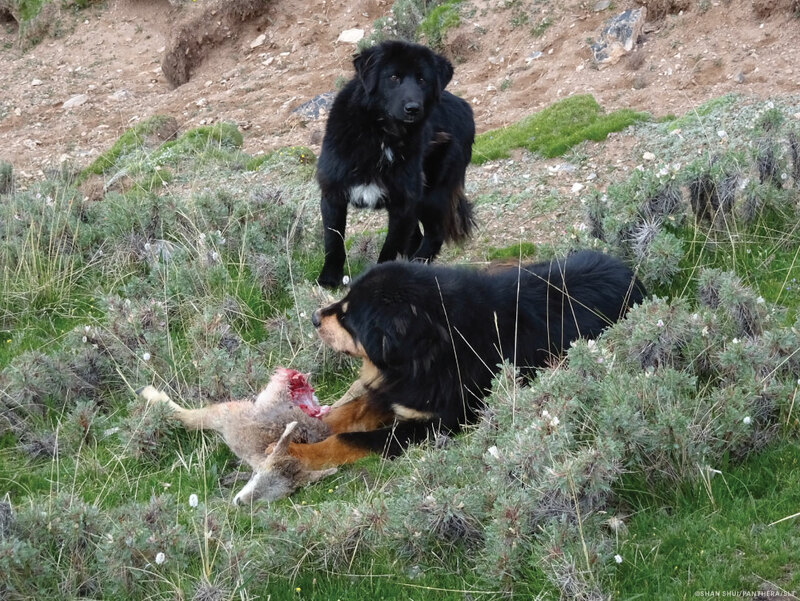 Last July, while staying near the Zhaxilawu monastery, Li and a guide were up in the nearby rocky mountains when some roaming dogs gathered around the monastery, most of them Tibetan Mastiff mixes, chased off a snow leopard that had been feasting on a dead lamb. Dogs surrounding bear on a ridge near Zhaxilawu monastery in Tibet. This and subsequent photos courtesy of Panthera, the global wild-cat conservation organization. Blue-sheep lamb killed by a snow leopard, which was later run off by Tibetan Mastiffs. Li says that in confrontations between snow leopards and Tibetan Mastiffs, the outcome depends on the numbers: “If there are more than four or five dogs against the snow leopard, the dogs will win. But it’s hard to estimate the outcome, because usually the snow leopards run away.” Though it might not be commonplace, the dogs can make contact with the cats: In 2011, a camera in a remote mountainside in Himachal Pradesh, near India’s border with Tibet, captured an image of a pack of dogs attacking a snow leopard, which escaped with minor injuries to its rear legs. 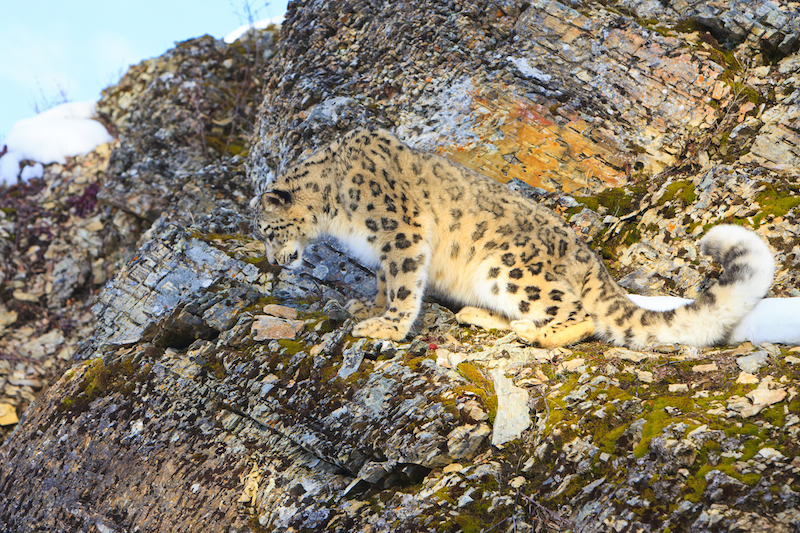 Li’s bigger concern is that continued hunting pressure from the dogs could force the snow leopards to shift their hunting behavior — specifically, the times when they are on the prowl — with unknown ecological effects. He notes that the dogs do hunt in packs, “but not like wolves, which have specific jobs for each pack member.” And while he says local people have told him that the Tibetan Mastiffs sometimes hunt with wolves, he’s never found any evidence of that. In a blog post about his experience at the Tibetan monastery, Li reflected on how dogs can both help and hinder research like his. 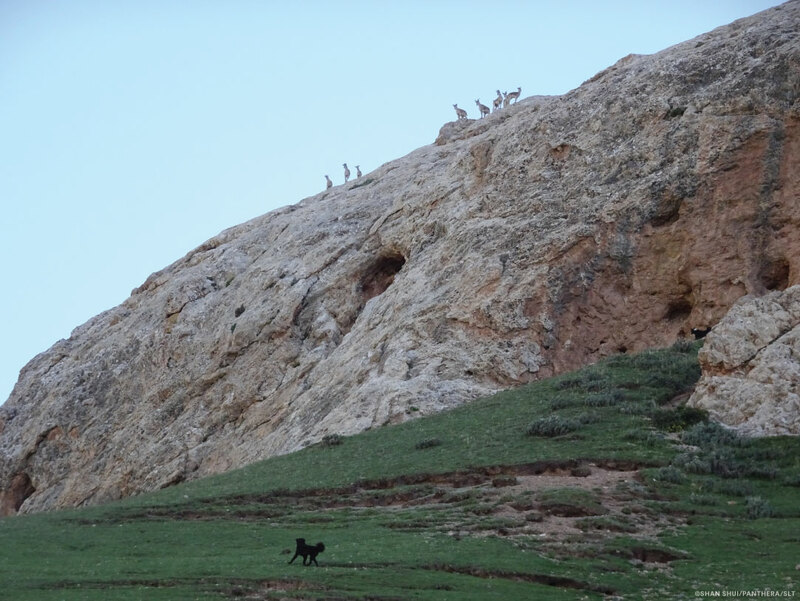 Blue sheep on a ridge near Zhaxilawu monastery in Tibet, as a Tibetan Mastiff spots them below. 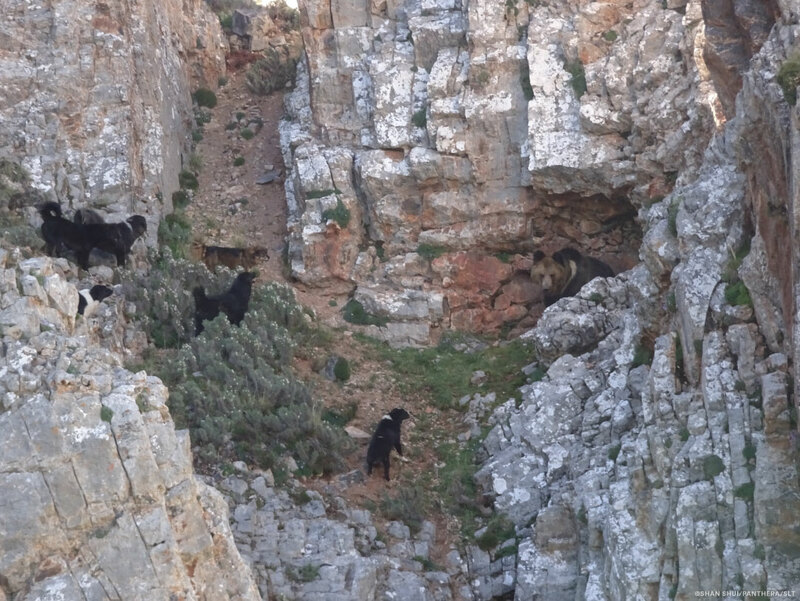 Li plans to continue his observations of these throwaway Tibetan Mastiffs and their feral feline neighbors, hoping to uncover a solution that benefits both species in this rocky, windswept roof of the world. © Modern Molosser Magazine. This article may not be reposted, reprinted, rewritten, excerpted or otherwise duplicated in any medium without the express written permission of the publisher.